On a day when two-times Wells Fargo winner Rory McIlroy started with a smooth three-under-par 68, John Peterson made consecutive eagles for a sizzling 65 to take the lead at the Wells Fargo Championship in North Carolina. Tiger Woods, however, struggled to adjust to slow greens as he slipped six strokes behind American leader in the opening round of the Quail Hollow event in Charlotte. Peterson, a former American collegiate champion, led a group of five players by two strokes, while Woods missed two putts from inside five feet en route to a 71. 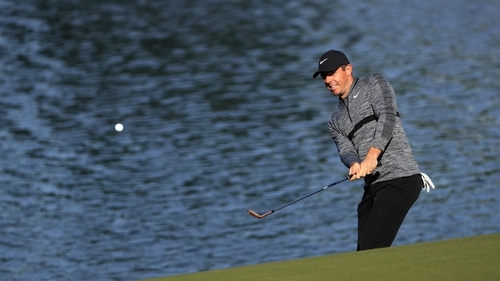 Four-time major winner McIlroy and 42-year-old Woods are both making their first starts after disappointing performances at the US Masters. Woods tied for 32nd at Augusta National, while McIlroy squandered a chance to complete the career grand slam after starting the final round in second place behind eventual champion Reed. McIlroy says he licked his wounds for about a week after a final round 74 at the Masters, but is now trying to look forward rather than back. "I would have taken that score before I went out there," he said of his 68. "I struggled a little bit with my game in the pro-am yesterday. "I did some practice yesterday afternoon which seemed to pay off. I could take it straight from the range onto the golf course this morning. "I was a little apprehensive today. I didn't know what to expect. I made some good swings and hit some good putts." Woods, a 79-times PGA Tour winner who needs three more wins to match Sam Snead's all-time record, used a new set of irons but it was the flatstick that caused his problems. "I struggled with my speed all day," Woods said. "It's weird. The greens are slow. They're springy and firm. That's not a combination you would expect. I struggled making the adjustments today." Woods, healthy again after a spinal fusion more than a year ago, is playing his seventh tournament of the year. He said he was now in "playing shape" and the goal was "just trying to get a little better." The Northern Irishman clinched his first PGA Tour victory at Quail Hollow in 2010, while American Justin Thomas last August captured his first major on the same course. Thomas made a mediocre return to the venue on Thursday with a two-over 73, while Masters champion Reed fared better with a 71. Graeme McDowell matched Woods' level par start to share 34th place as the 2010 US Open winner enjoyed a mixed round with four birdies cancelled out by four bogeys. Five bogeys saw Shane Lowry finish with an opening round 74, while Seamus Power also shot three over with both players sitting two shots off the projected cut.